The latest drought report came out this week and it paints a pretty grim picture for much of the west, southwest, and south central United States. The good news is relief may be on the way for some of these locations, the bad news is maybe not for California -- at least in the short term. California, suffering from a long winter of above normal temperatures and below normal precipitation is now facing extreme fire danger as we head into the summer months as we saw this week. The pattern, as we've discussed at length, hasn't been favorable all winter for precipitation in the west. This week record high temperatures, strong winds, and humidities in the single digits sparked an incredible few days of destructive fires across southern California. Several locations in southern California broke their record for the earliest triple digit heat of the year, and in several cases by more than three weeks. While shifting winds will help cool temperatures and return some moisture to the air in the region this weekend, little relief in the form of precipitation is in the forecast. 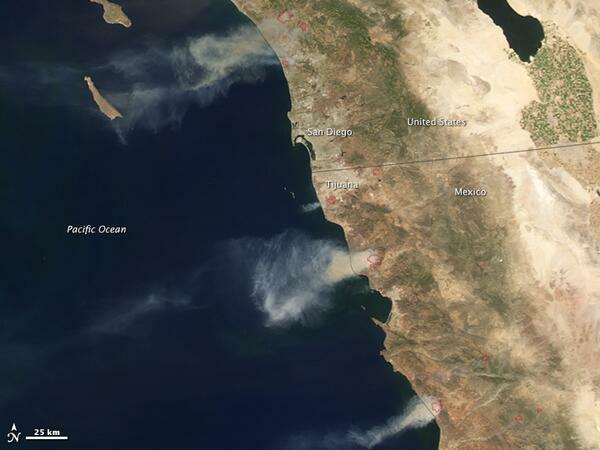 Here's an incredible image of the fires shared by NWS San Diego on Thursday via NASA Earth. In the most recent update from the U.S. Drought Monitor, the entire state of California is classified as under Severe Drought or higher, with 24% of the state experiencing Exceptional Drought. This is compared to 0.0% under Exceptional Drought a year ago, and 46% Severe Drought a year ago. Further east drought conditions are also quite grim. 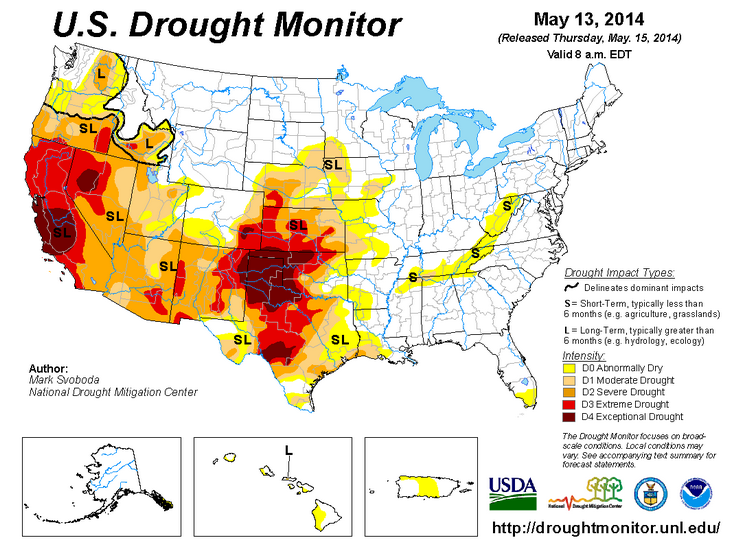 Northwest Texas has seen their drought worsen over recent weeks. Now 20% of Texas is also experiencing Exceptional Drought, up from just 0.71% three months ago. Across south central Texas last week's storms did offer some relief, and if the forecast verifies, the next round should set up even further west. Take a look at these good totals from the Dallas/Fort Worth area last week. Colorado as a state has been doing much better when compared to just a year ago. The exception of course being the southeast corner of the state. Just 55.5% of the state is classified as Abnormally Dry now, down nearly half of where it was a year ago. Colorado's area of Exceptional Drought hovers around 2%, and has been so for several months now. The southeast corner of the state has been skipped almost completely with each of our recent storms, while big precip makers have hit pretty regularly this spring for the northern half of the state. Current snowpack number continue to be very good across the state. After last week's huge snows basins went up dramatically across northern Colorado, boosting the statewide snowpack to 120% of normal for the date. 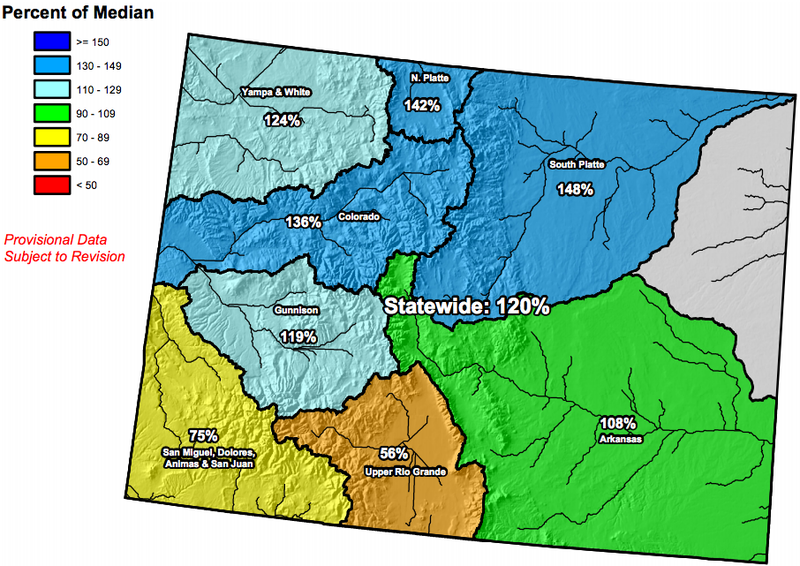 Notice in the map below that while northern Colorado basins are well above normal, the same is not true in the south. As our pattern remains in an active one, the drought area will continue shifting southward and statewide drought numbers will continue to drop. With a developing El Niño, southern sections of Colorado will become more favored for the valuable moisture they need. 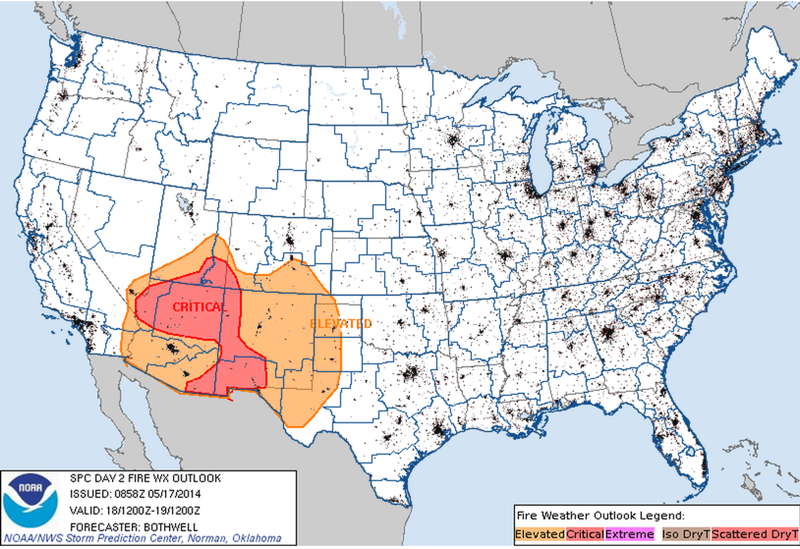 Let's hope it is before wildfires are sparked there, as fire danger is already elevated to critical across southern portions of Colorado, and the southwest. For now, we are still in a La Niña phase which favors local moisture over northern Colorado. This pattern continues for the upcoming week, sending a "supply train" of rain and thunder from the northern Rockies to northern Colorado and onto sections of the plains. 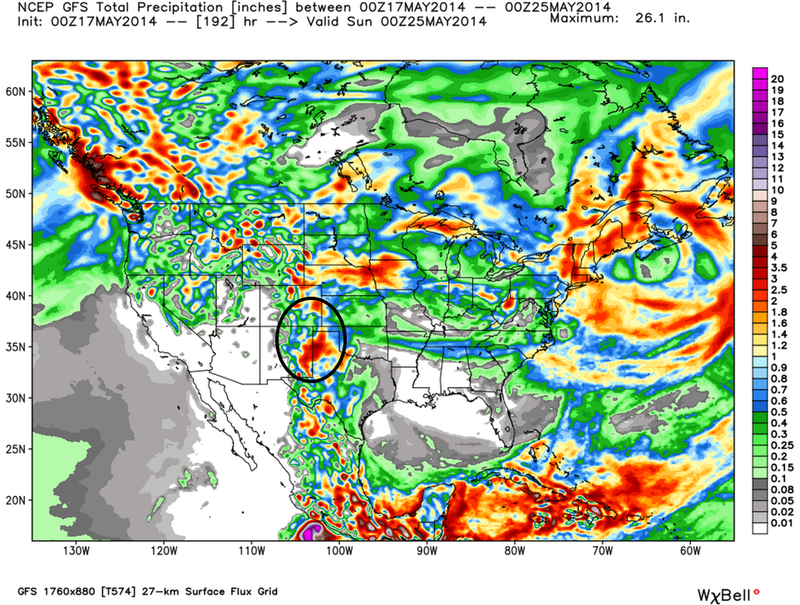 Models continue to show a very wet period for eastern Colorado as a large trough digs into the west. At this time there are some differences in timing as to when our best shot at this heavy precipitation could come, so for now will gradually increase rain and thunderstorm activity for the mid-to-late week period. Notice too that the upcoming pattern will also favor moisture from New Mexico to Texas, the same area under Exceptional Drought outlined above. We will focus more closely on the upcoming pattern in upcoming posts already in the works. For now, take a look at all the precipitation the GFS tries to bring through May 25.